Melanie and Jesse married on June 1st at the beautiful Greystone Estate in Ball Ground, Georgia. Yes, I know… It’s now December but I just couldn't let this wedding slip through the radar. It rained all morning leading up to the ceremony with very infrequent breaks in between but they didn’t let that stress them out or take away from their day. We can’t control the weather and Melanie being the calm and collected bride she was was quick to accept and move forward with our rain plan. Most brides marry outside at The Greystone Estate. The surroundings are quite incredible and make for some amazing photos but I will tell you …. after you witness this wedding, you' may find yourself wanting to marry inside at The Greystone Estate! Amber Cather Photography did a stellar job capturing their wedding day and the gorgeous surroundings despite the less than stellar weather conditions. The bridal party was able to sneak outside after the Ceremony for some photos and later the Bride and Groom for some ‘sunset’ shots. Y’all… overcast skies and rain can make for some truly incredible photos! Please scroll for some of my favorites from their wedding day as well as a complete list of vendors who made this day possible. 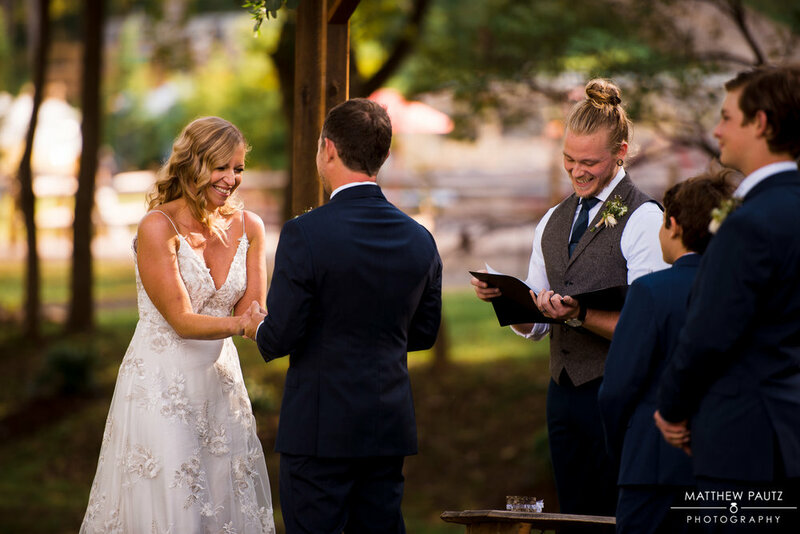 I had a guest tell me that they loved being able to see the bride and groom and their expressions throughout the ceremony in the mirrors and I just LOVED that! Congratulations to the Newlyweds, Mr. and Mrs. Erickson! It was a pleasure helping you throughout your planning journey.